Jayco Electricals are manufacturers & suppliers of power transformers, distribution transformers, current transformers, potential transformers, combined CT-PT unit, metering cubicles, furnace transformers, auxiliary transformers, servo voltage stabilizers and dry type transformers. Eagleman enterprises are leading manufacturers and suppliers of control panels, electromagnetic relay, control panels, avrs, ups, liquid level indicator, road signals, etc. moreover, for various types of applications, customized electromagnetic relays. Manufacture, retail and export a wide range of crane control gears, insulated conductor bar, crane control gears, radio remote control systems, thrusters, thruster brakes, pendant push buttons, electromagnetic brakes, rotary limit switches, crane limit switches, resistance boxes / dbr, master controllers, flameproof brakes & limit switches, brake drum & couplings etc. Sai Electricals is manufacturer and exporter of servo voltage stabilizers, transformers, automatic voltage controller, power factor controllers, soft start motors, variable voltage variable frequency drives, energy audit services, power conditioning equipment, etc. "2W Isolated Wide Input Single Output DC/DC Converters The TP2L is a series of high performance miniature DC/DC converters having regulated outputs over the wide temperature range of -40 degree centigrade to 85 degree centigrade. The input voltage range is 2:1 isolation is 1kVDC. Continuous short circuit protection, external control and extremely small SIP packaging. " Leading manufacturers and suppliers of motorized lubrication unit, progressive block, radial lubricator, hand operated oil pump, float switches, pressure switch, lubrication timer, pneumatic operated grease pump, progressive block (oil / grease), motor pump assembly, plunger assembly, electronic controllers, manual two line grease pump, hand operated grease pump, multi point radial lubricator (grease / oil), hy./pn. operated pump (oil), dual line dose feeders and metering cartridge. Suppliers, exporters and retailers of video surveillance recorders, electronic surveillance system, samsung cctv dome cameras, surveillance cameras, video surveillance camera lenses, ideo surveillance camera parts, article surveillance, electrical door, burglar alarm system, video surveillance equipment, vehical tracking system. Real Green Engineers Pvt. Ltd.
J.k. Automobiles is manufacturer, supplier & exporter of all kinds of automotive components like axle parts, suspension & steering parts, suspension Rubber kits & all rubber bushes, engine mountings, radiator & fuel hoses, water pump & pullys, electrical parts, brake parts, clutch & pressure plates, etc. Engaged in the design & manufacturing of test facilities, test rigs, material handling equipment such as hydraulic and pneumatically operated lift platforms, conveyors, belt loaders and hydraulic power packs and cylinders. Intec Export India Private Limited offer a notable assortment of Milk Cooling Tanks. In order to retain quality, these Milk Cooling Tanks are exactly manufactured with top quality stainless steel in accordance with quality standards. Available in various specifications, these Milk Cooling Tanks can also be customized accordingly with requirements of customers. Intec Export India Private Limited provide these milk coolers at nominal price to the customers. 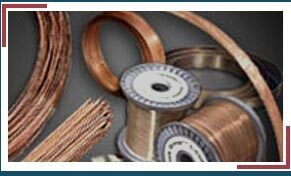 Manufacturers & exporters of silver brazing alloys, silver brazing alloys, copper brass brazing alloys, phosphorous silver brazing alloys, gas welding wire, etc.